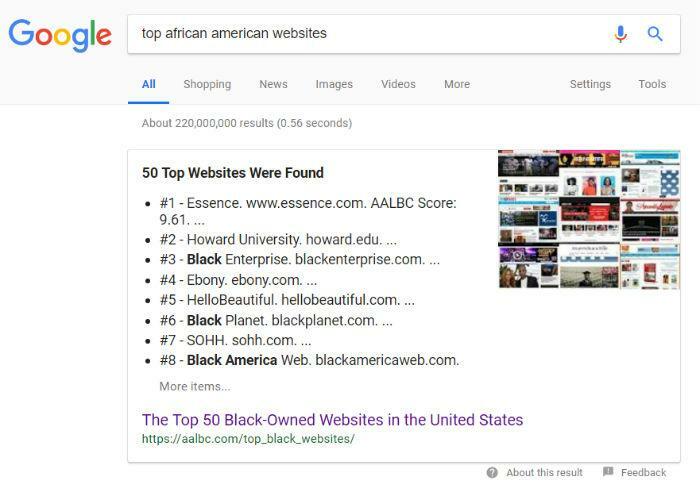 When you ask Google Home's Smart Assistant to “name some African American websites,” Google pulls the information from AALBC. While Google cite's AALBC as the source, I would be much happier if they compensated me for my research. If AALBC's information is good enough to reference on a service for which people pay them, shouldn't AALBC.com be compensated? Honesty I don't mind Google or anyone sharing the information -- indeed I encourage it. This is why I researched the information and maintain it on AALBC, but if a multi billion dollar corporation is using it to enhance their services, why shouldn't the underlying sources, like AALBC, be compensated? I'm not talking about a lot of money, a buck a query, 10 cents, a penny -- something! Google presents the same information information on their search engine results page (see screenshot below). Google calls these “Rich Snippets,” and encourages developers to markup their HTML to make it easier for Google to pull this information from their webpages to create these rich snippets. The problem with these rich snippets, on the web, is that they discourage searchers from visiting the underlying websites. As these Rich Snippets often provide the answers searcher are seeking right on the search engine results page (SERP). Google argues this provides the best search experience for their visitors, this may be true, but the reality is that it this is killing the underlying websites by robbing them of traffic they would have received if Google did not put the website's content right on the SERP. I've argued for years that Google putting their own bookstore on the SERP page has all but killed Black book websites. I just read an article on the New York Times, “The Big Secret of Celebrity Wealth: (Is That No One Knows Anything) Chris Hemsworth, Chris Pine and Chris Pratt are cumulatively worth $150 million, according to your Google results. Are they really?” This article was interesting because it informed me that Google is using these rich snippets on the Home devices. I was already aware that query above generated a Rich Snippet in on the Google SERP and I was able to quickly confirm that Google was using the same information in their Home devices which is depicted in the video I created above. The Times articles focused on the inaccuracy of the information provided by Celebrity Net Worth, that Google is sharing, while The Outline's article focused on how Google destroyed Celebrity Net Worth's traffic. Google asked Celebrity Net Worth for a sample for their data for potential use on Rich Snippets. Celebrity Net Worth declined, not seeing and benefit, and Google took the data anyway -- causing an immediate 65% drop in Celebrity Net Worth's traffic. I actually reached out to the owner of Celebrity Net Worth and explained that the same exact thing happened to my website thanks to Google's bookstore. There are not too many people who "get this" and it was refreshing to talk to someone who does. He encouraged me to reach out to The Outline, who ultimately ran a similar story about AALBC, “Google is jeopardizing African-American literature sites.” While the article made some important points, it also provided an unusually harsh and factually inaccurate critique of the website. After some back and forth I was able to get some of the inaccurate information about the AALBC removed. Despite that experience, I'm still glad the article was published, because people can judge AALBC for themselves. Speaking about Google sharing inaccurate information, Google exploits Wikipedia to the hilt. I wrote about this over 5 years ago in an article, “The Pimping of Wikipedia: Contributing to the Decline of the World Wide Web.” Google makes liberal use of Wikipedia's information not just in the Rich Snippets, but Google also uses Wikipedia's images and biographies for the author information in their own book store! Now if I copied Wikipedia's information directly, as Google does, Google would bury AALBC in search results -- rendering it undiscoverable. Since Google is monetizing Wikipedia, why is Wikipedia always begging for contributions?! I will never give Wikipedia a dime. Google needs to pay Wikipedia, and Wikipedia needs to pay the people who create Wikipedia's content -- end of story! This is just one reason wealth inequality has greatly increased. The writers who contribute content to Wikipedia are expected to volunteer their services while Google gets rich off the content. Don't for one second think that because users get answers from Google for "free" that there is some societal benefit here: There isn't. As websites are weakened by Google using their content without compensation, the ability of these websites to provide continue to produce quality content is diminished. Google still relies on their information and quality of Google's answers suffers -- often with comical results (or tragic depending upon you perspective). I'm planning to publish a book next year, basically a book of AALBC highlights. I'm going to include articles I've written, book lists I've compiled, as well as lists like the one Google is using on their Home system (The Top 50 Black Owned Websites). As always, I welcome feedback -- do you think anyone cares about Google using a website's content on their products? Do I present the information (on the blog) in a way that is at all interesting? I think it is the right time. That is the capitalist model which makes Bezos a Billionaire but his workers don't share in the wealth. But do you think this particular message will resonate with the regular (non-techie, non-entrepreneurial) Black person?